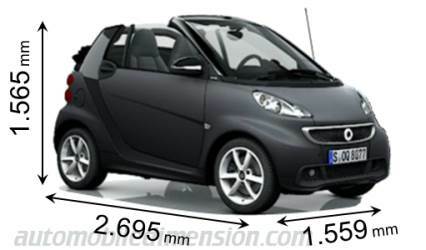 Range of Smart automobiles to help you find a new car according to the size of each vehicle. Width measurements are indicated without exterior mirrors (in brackets with mirrors unfolded). 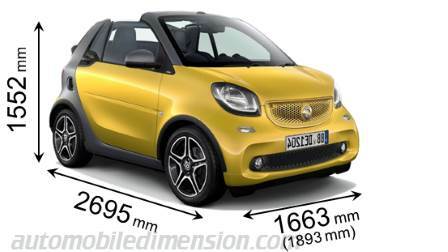 Model replaced by the new fortwo cabrio in 2016. 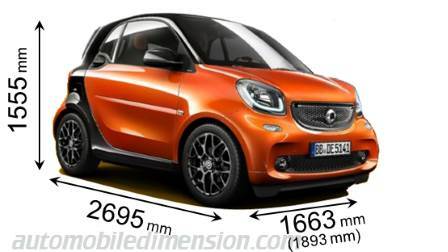 Model replaced by the new fortwo in 2015. 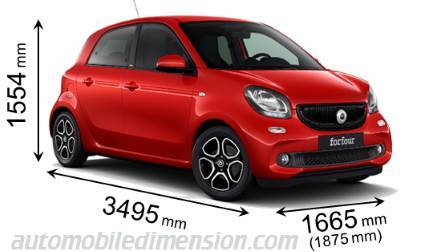 Model replaced by the new fortwo cabrio in 2012. Use the car comparison tool to simultaneously compare the external dimensions and boot of three new or previous automobiles to choose from different makes and models. 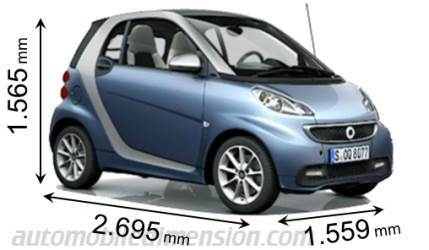 Discover which vehicles of any make are similar-sized to the Smart model you choose in its three dimensions of length, width and height. The search engine sorts new vehicles of any make according the dimensions of length, width, height and boot capacity you specify. Simulation of the space occupied by the dimensions of a car parked in its parking and garage entrance. Select the model and the measurements of the parking space. 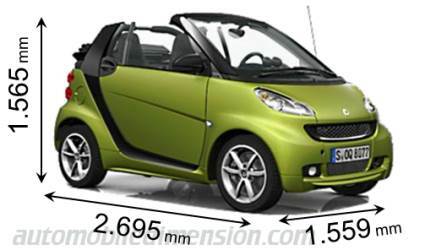 Specs of length, width and height of each vehicle Smart are expressed in millimeters and the boot space in dm3, equivalent to liters. Width measurements are indicated without outside mirrors and in brackets with mirrors unfolded. The height is indicated without the external antenna and with or without roof bars according to the most usual configuration.